When it comes to the genre of silent comedy, everyone’s familiar with the great Charlie Chaplin– perhaps the single most famous figure in cinema– and the solemn-faced Buster Keaton has a large and devoted following as well. 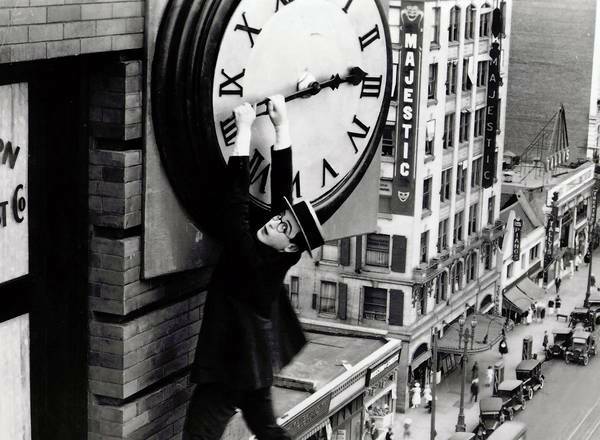 And even if you haven’t seen his movies, the image of Harold Lloyd dangling from that clock is no doubt etched into your mind. Actually showing it might not be necessary. But while these three were certainly at the top of their genre (they were considered exceptional even back in the 1920s), there’s a ton of silent comedy to explore even beyond their extensive filmographies, everything from “polite” comedy to farce too, yes, even custard pie-throwing. 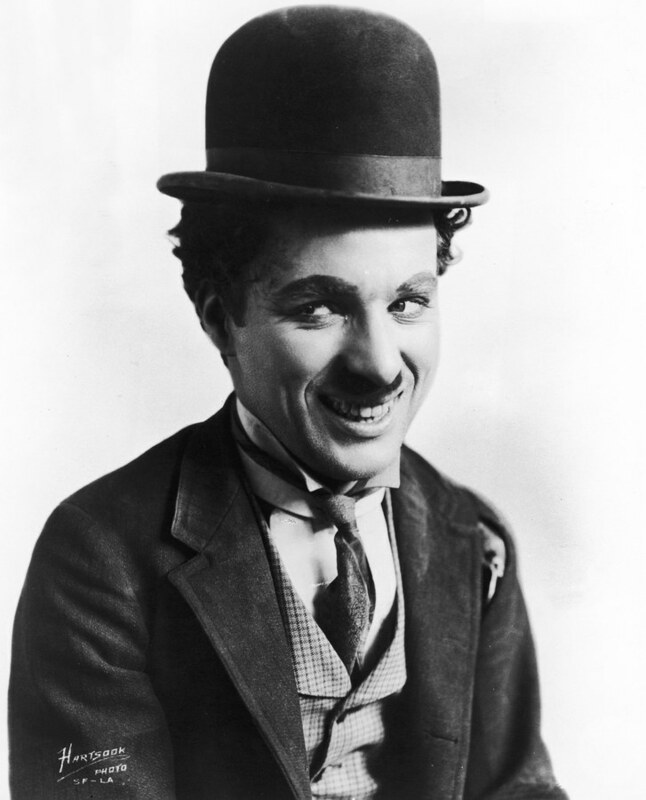 Who were the very first film comedians? If we’re being technical, we might say some of the earliest film comedians were stage actors and vaudevillians who agreed to perform their acts in front of motion picture cameras (filmmakers back then loved to document popular stage acts). Although the “pictures” were low-brow entertainment at the time, some actors quickly realized that films allowed them to be seen by tens of thousands of people all over the country–more than the biggest theaters could hold. 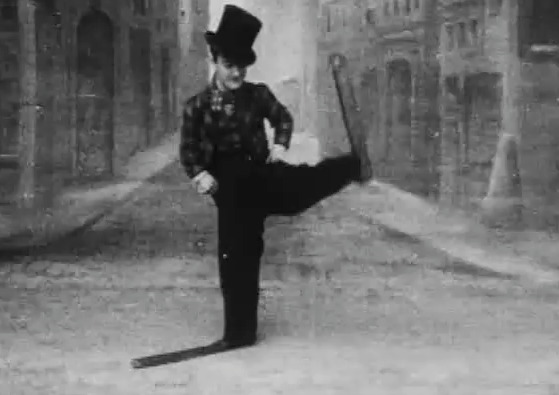 English comedian “Little Tich” performing his Big Boots dance. Among the very first silent comedy stars were the French comedians André Deed (who played a bumbler named Foolshead) and dapper, top-hatted Max Linder. Linder, in particular, could be considered our very first official movie star, since the Pathé studio decided to launch a full-on publicity campaign for him–a first for a film actor. Other comedians began following in their footsteps, resulting in a full-on flood by the early 1910s. Studios like Biograph, Vitagraph and Edison made sure to offer light comedies along with their usual dramas, making comedians like John Bunny, Flora Finch, Alkali Ike, Wally Van and Lillian “Dimples” Walker familiar to many theatergoers. 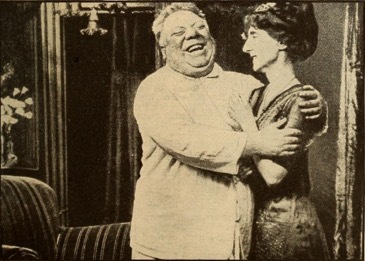 Bunny and Finch in Bunny’s Birthday Surprise (1913). 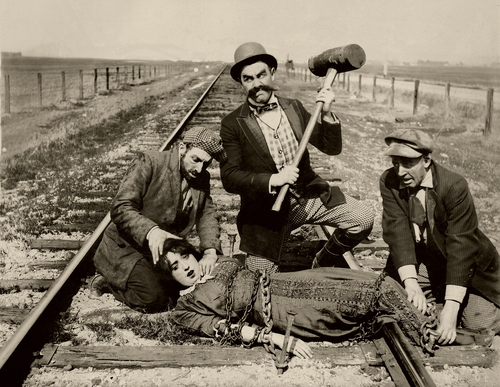 In the mid-1910s silent comedy was beginning to establish itself, and there was a more definite divide between light comedy and zany slapstick. A studio like Vitagraph was associated with more “genteel” humor while the Keystone Film Company is even today synonymous with slapstick. By this point, the most popular comedians included Mabel Normand, Roscoe Arbuckle, Ford Sterling, Mr. and Mrs. Sidney Drew and Fay Tincher. 1914 would turn out to be a hugely significant year. For one thing, there was a sudden rise in comedy duos, from Plump and Runt (“Plump” being played by Oliver Hardy!) to Pokes and Jabbs to Waddy and Arty. These would pave the way for the famous teams to come, such as Laurel and Hardy. 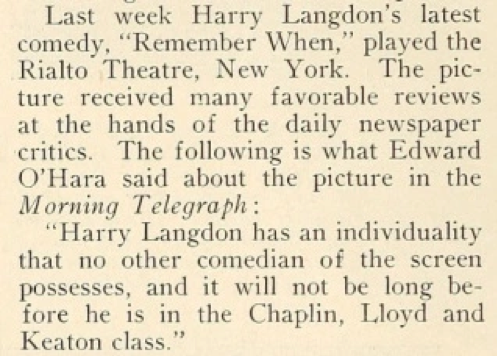 And for another thing, this was when a British music hall performer named Charlie Chaplin decided to join the Keystone studio. He quickly proved himself to be a unique and charismatic performer, and within the next two years, he would be the most popular comedian on the planet–if not the most popular face in cinema. In 1916, stage star Minnie Fiske wrote an article proclaiming Chaplin a “genius” and an “artist,” and the world’s been calling him the same ever since. New comedians kept cropping up throughout the rest of the Edwardian era. By 1917, Larry Semon’s broad slapstick was very popular, and a fellow named Harold Lloyd was starting to make himself noticed. Cross-eyed Ben Turpin was a uniquely familiar face. Female clowns Alice Howell and Louise Fazenda were gaining fans, and Buster Keaton was appearing in his first films as support to the wildly popular Roscoe Arbuckle. By the early 1920s, Chaplin was still on top of the world, and Keaton had his own film studio where he was churning out well-received comedies. Arbuckle was no longer in the picture thanks to the unfortunate Labor Day scandal in 1921. Harold Lloyd had worked his way up to being a box office sensation and would remain one of the top movie stars right up to the end of the silent era. Indeed, Chaplin, Keaton, and Lloyd were widely acknowledged as excellent comedians, and any new comics who became successful were usually compared with them at some point. Clipping from Exhibitor’s Trade Review, June 6, 1925. Highlights of the 1920s included a baby-faced comedian named Harry Langdon becoming a sensation, and Stan Laurel and Oliver Hardy finally being teamed up in a series of shorts. All-American types like Johnny Hines and Douglas MacLean made a number of hits, and the Our Gang series started in 1922 and wouldn’t stop until 1944. There were also a number of stars who were adept at both comedy and drama–actresses like Mary Pickford, Constance Talmadge, and Colleen Moore being among them. In general, much of silent comedy had hit its stride by this decade, with finer cinematography being used and the pace of many films actually being slower than your typical hectic, high-energy 1910s slapstick shorts. Colleen Moore in Her Wild Oat (1927). Throughout the whole era there were, of course, countless comedians who tried and failed to make it big, or else became popular for just a short time, or else gamely acted in countless shorts that always seemed to fly just under the radar. Then there were the hundreds of supporting players, of all ages and appearances. The names could easily fill a good-sized book–and their surviving films makes for years of quirky enjoyment. I hope you enjoyed this brief tour (and yes, it’s very brief) through the crowded world of silent comedy. Feel free to explore it at your leisure, and thoroughly, too–for you never know what obscure performer might end up becoming one of your favorites! This entry was posted in Posts by Lee Stans, Silents are Golden. Bookmark the permalink. Thank you for this overview. I love old movies but know very little about the silent era. Each time you post I try to find some actual footage of at least one star to put the information in context. 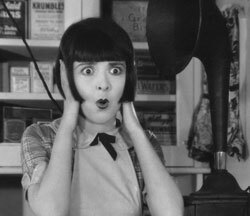 Since I was quite taken by the picture of Colleen Moore, I tracked down one of her early comedies, ELLA CINDERS, and enjoyed her performance. Great post. It’s always wonderful to know about the early pioneers of comedy; the silent film stars and stuntpeople who shaped comedy to be what it is today.